21 players to fill in the feedback questionnaire. Thank you! For those who did not, but have valuable idea’s or/and feedback, please share your idea’s via PM to the WCO Team ( Karaiskakis, Morx, Nortrom ). Via this post, we would like to share the received feedback with you. 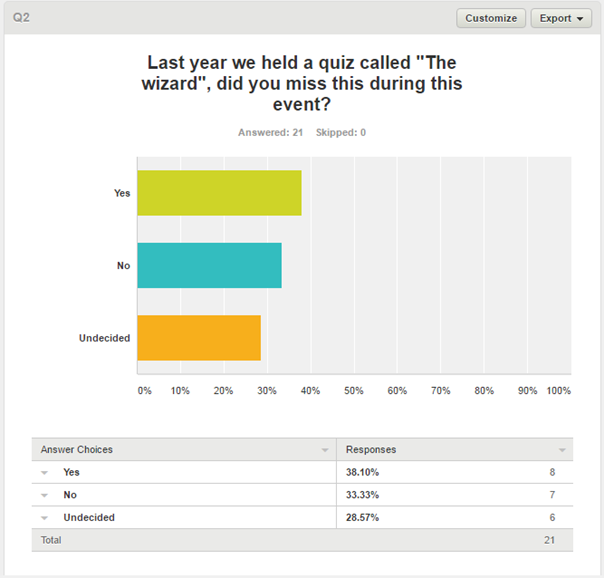 This question in particular gave interesting results, 8 players missed “The wizard”, 7 did not, while 6 were undecided. We will look into what we can do for next edition of the WCO. A very big majority of the players approved of the decision to abolish the Skype requirement. For us this is very valuable feedback. We noticed that after we decided to drop the requirement, more registrations followed. Another very big majority seems to be in favor of the Swiss System ( The one used during live tournaments ). A lot of mixed answers came in, some players thought the amount of previews were just enough, others would have liked to see only the last few rounds or have the previews reserved for “big games”, while other players would have liked to see them from the start. We will definitely keep the previews in for next year. The general consensus was that the players are happy with the WCO team as is, thanks guys! Transparency regarding warnings / disqualified players. Some sort of time control for auto drawing and lack of progression of the game. No show and claim rules. Most players felt that the Swiss System ensures a balanced mix of opponents based on their own performance. Players also liked the fact that after losing one or two games, they were not out of the tournament, but instead, were still able to get quality matches. Feels like just another tournament. Timing of the WCO, so the 2016 tournament, doesn’t finish in 2017. A reporter among the WCO team. Player interviews ( we thought of this for 2016 aswell, but never got to it ). Discontent with the way the last game was handled. When will the third WCO be held? Unfortunately we do not have a definitive answer to this question (nor have we discussed it), but I assume halfway through september 2017.